This glitteringly illuminated codex made for Franciscan use is a witness to the glorious book production in Avignon in a well organized scriptorium, highlighting the role of the corrector, who names himself “Sy[mon]”. An added device refers to the Franciscan cardinal Pierre de Foix and puts the book in its most interesting Avignonese historical context. A Gospel Lectionary contains readings from the Gospels arranged in the order of the feasts of the year. It was used during the celebration of Mass, when at least two readings from the Gospels on the Life of Christ are presented to the community, on Sundays and High Feasts sometimes even three. As the readings are only a portion of a chapter, they often begin with the words ‘In those days’, or ‘Jesus said...’. Finely decorated initials (understandably mostly I and J) introduce the texts for the major celebrations of the year, and numerous smaller decorated initials mark the beginnings of the remaining readings. Executed in gold, red, and azure, these initials with delicate pen-flourishes are reminiscent of the work of Jacquet Maci (fl. c. 1323-45) and those working in his circle. Maci began his career in Avignon, before he moved to Paris. Interestingly, in one section of the manuscript at the texts of the Passion-tide, numerous small intonation or recitation signs appear above various letters. Here also, the letters s and c written in red ink indicate a role division between sacerdos (priest) and chorus or communio (the choir or community of monks). These provide for a change in recitation according to the solemn and festive character of the liturgy of that period. This is a well organized book, made and controlled by professionals, as is indicated by the fact that all quires have been checked and approved by a corrector who left his signature of authorization in the lower margin of each quire's last page, scribbling "Cor(rrectio) p(er) Sym(one)". At the end of the book, the motto "Servire deo regnare est" (to serve God is to reign) is added, likely referring to the bibliophile Pierre de Foix (1389-1464), a Franciscan cardinal active in Avignon for many years. He had a taste for finely decorated manuscripts on which he is said to have spent ‘more than a 1000 gold pieces’. 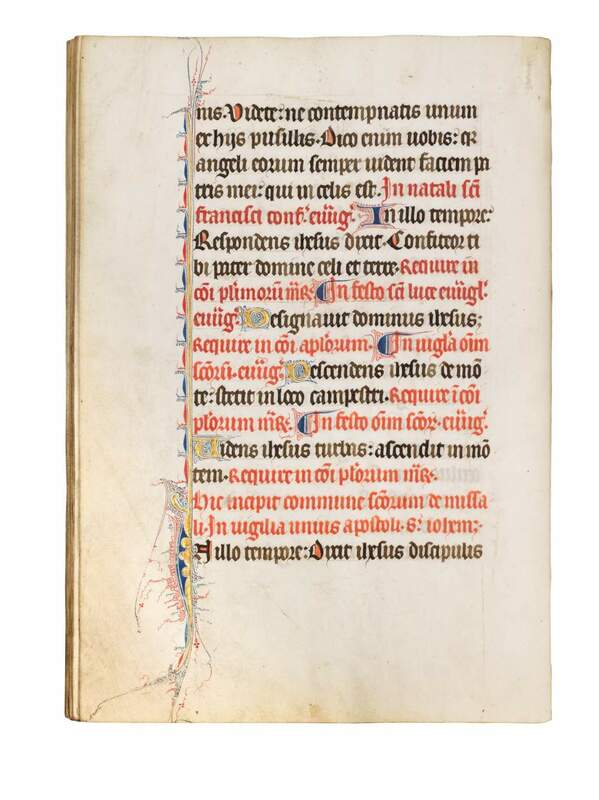 After he managed to recollect from the papal library in Peñiscola (1429-30; the papal refuge south of Barcelona) hundreds of books that had been taken from Avignon, the cardinal kept many for himself. He then bequeathed most of his manuscript collection to the Collège de Foix in his hometown of Toulouse. Over the years, many of these were scattered before Colbert took the remainder of the library to Paris. The present manuscript is a fine, complete, 14th-century Gospel Lectionary made for Franciscan use. Even though the Franciscan order strictly adhered to the rule of poverty, the use of gold for letters in a liturgical book was not considered too frivolous for communicating the words of God and were designed for his service. The most prestigious Franciscan institution in Avignon was the convent of the Cordeliers: the book at hand may have served in its church where Pierre de Foix also found his last resting place. See also our Spotlight 'Catalonia and Southern France'.